December 24th, 2016, Concert at Belgharia Ramkrishna Mission, Kolkata, West Bengal, India. 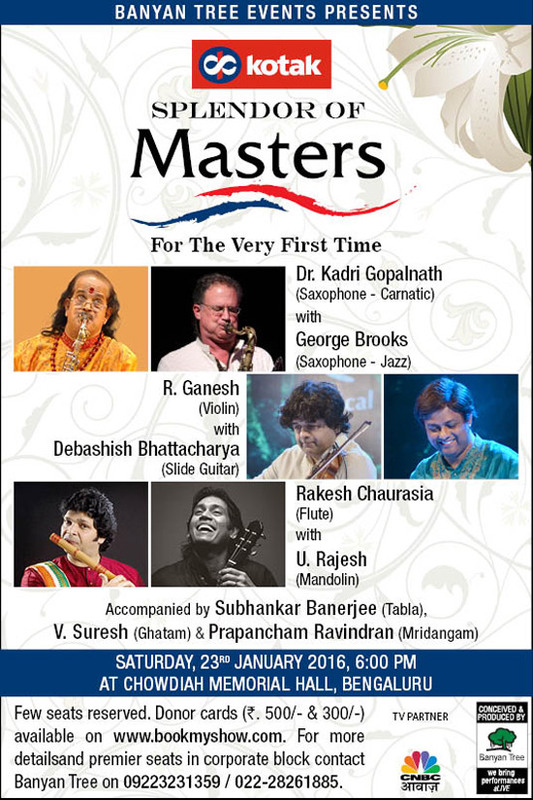 December 31st, 2016, Concert at Shri Rama Kala Vedike, 3rd Cross, NavyaNagar, 71, Jakkur Rd, Jakkuru, Bengaluru, Karnataka, India. Royal Albert Hall, London, United Kingdom. Barbican Centre, Silk Street, EC2Y 8DS London, United Kingdom. October 24th - 26th, 2016, Master Classes and Workshop at the NYUAD, Abu Dhabi. October 27th, 2016, Thursday, 8pm, Performances by Driss El Maloumi & Debashish Bhattacharya at the NYUAD campus East Plaza. The Montana Folk Festival in Butte MT. 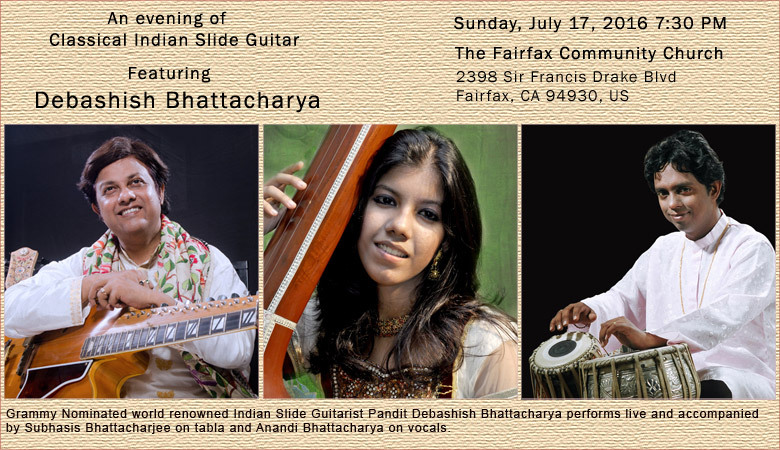 July 17th, 2016, An Evening Of Classical Indian Slide Guitar, Pandit Debashish Bhattacharya performs live and accompanied by Subhasis Bhattacharjee on tabla and Anandi Bhattacharya on vocals. The Fairfax Community Church, 2398 Sir Francis Drake Blvd, Fairfax, CA 94930, US. 320 Cedar St #2, Santa Cruz, CA 95060. The Lowell MA Folk Festival. June 18th, 2016, ( 18.06., g. 22 ), Concert at Castle Courtyard, Zamek culture Centrum, Poland. Polish Radio's Studio im. W. Lutoslawskiego, Warsaw, ul. Modzelewskiego 59. May 28th Saturday, 2016, 10.15pm - 11.45pm, Concert at Brighton Dome Concert Hall, Brighton, UK. 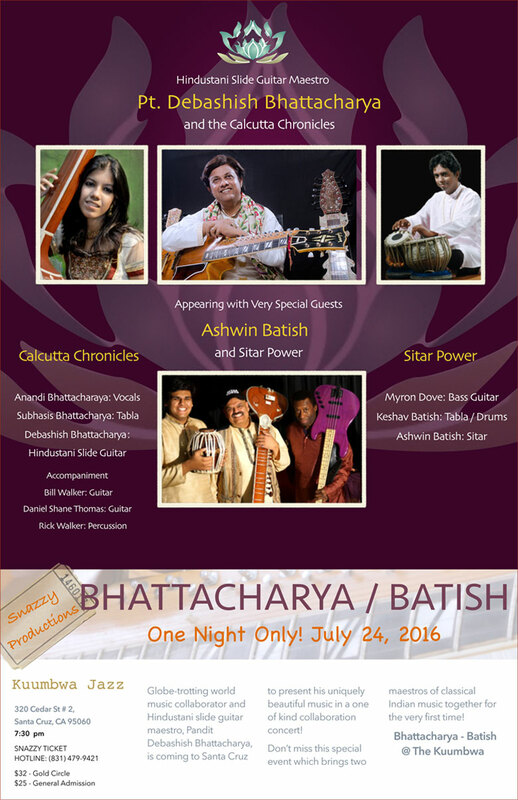 March 20th 2016, Debashish Bhattacharya, accompanied on Tabla by Bobby Singh, Concert at Lennox Theatre, Parramatta NSW 2150, Australia. February 13th, Concert at - World Sacred Music Festival, St. Augustine Ruins, 8:30pm, Bainguinim, Goa, India. 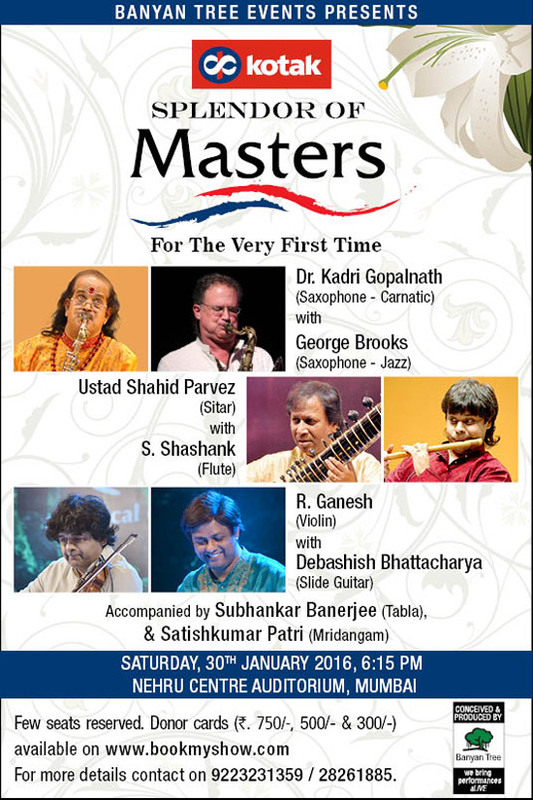 February 14th, Concert at Banaras Hindu University, Varanasi, India. January 6th, Evening 6:00 pm - Inauguration of IIGF 2016 at Satyajit Ray Auditorium RTC (ICCR), 9A, HoChi Minh Sarani, Kolkata, India. January 9th, Evening 7:30 pm, featuring Calcutta Chronicles Band, G D Birla Sabhaghar (Birla Mandir), Kolkata, India. January 10th, Evening Concert with Pandit Swapan Chowdhury on tabla. G D Birla Sabhaghar (Birla Mandir), Kolkata, India. January 12th, Concert - Indo Creole Project Alliançe Française, Chandigarh, India. January 14th, Concert - Indo Creole Project Alliançe Française, Chandigarh (Anex), India. January 15th, Concert - Indo Creole Project Alliançe Française, AF, Delhi, India. January 16th, Concert - Indo Creole Project Alliançe Française, Trivandrum, India. January 18th, Concert - Indo Creole Project Alliançe Française, Chennai, India. January 23rd, Concert - Banyan Tree Festival, Bangalore, India. January 29th, Concert at Jamshedpur, India. January 30th, Concert - Banyan Tree Festival, Mumbai, India. 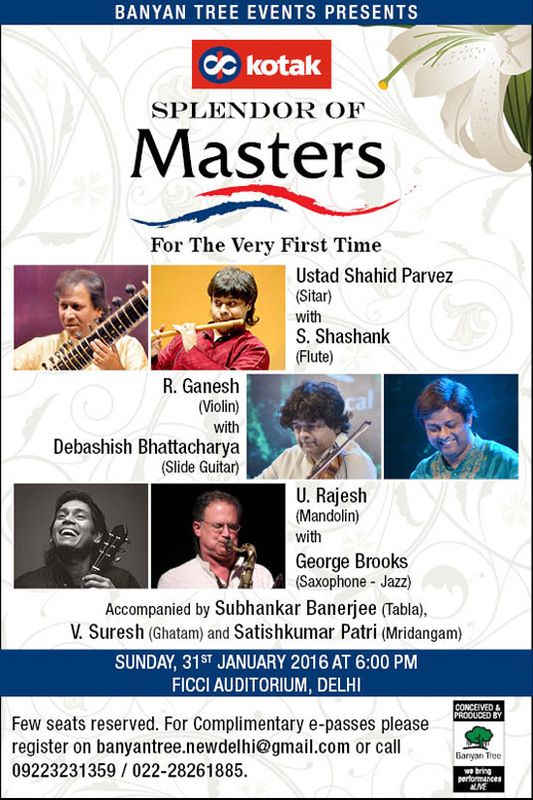 January 31st, Concert - Banyan Tree Festival, Delhi, India.